Jack married his best friend and sweetheart, June Elaine Brown on March 4, 1946 in Elk City, Oklahoma. June preceded Jack in death March 17, 2014. Jack retired from the United States Fish & Wildlife Department and was also a retired member of the Hammon Fire Department. 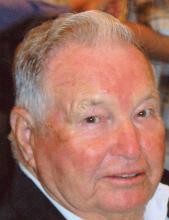 Jack was a member of the Hammon Round-Up Club, lifetime member of the American Legion, the Department of American Veterans (DAV), Veteran of Foreign War (VFW), the American Ex-POW Organization, and the American Defenders of Bataan & Corregidor. Family will receive friends Wednesday, March 27, 2019 from 6-8 pm at Martin-Dugger Funeral Home. Funeral services will be held at 10:00 a.m. Thursday, March 28, 2019 at the United Methodist Church in Hammon, Oklahoma. Rev. Amanda Lockwood will officiate and Dolan Ivey will assist. Interment will be at Red Hill Cemetery in Hammon, Oklahoma. Services have been entrusted to the care of Martin-Dugger Funeral Home. Cherishing his memory is his daughter, Pam Eslinger and her husband, Willie of Hammon, Oklahoma; five grandchildren, Jim Johnson and his wife, Jennifer of Merritt, Oklahoma, Jay Johnson of Hammon, Oklahoma, Jan Williams and her husband, CR of Guthrie, Oklahoma, Brian Eslinger and his wife, Shannon of Elk City, Oklahoma and Lorie Lee of Weatherford, Oklahoma; nineteen great-grandchildren; ten great-great grandchildren; two special nephews, Jerry Dean and his wife Debbie, Gary Dean and his wife, Sandy all of Hammon, Oklahoma. Memorials can be made to the Hammon First United Methodist Church or Hammon Senior Citizen Center in care of Martin-Dugger Funeral Home, P.O. Box 707, Elk City, Oklahoma 73648. To send flowers or a remembrance gift to the family of Jack Doyle Warner, please visit our Tribute Store. "Email Address" would like to share the life celebration of Jack Doyle Warner. Click on the "link" to go to share a favorite memory or leave a condolence message for the family.